RIVERSIDE, Calif. (http://www.ucr.edu) — Two species of songbirds that once made a home in the Bahamas likely became extinct on the islands because of rising sea levels and a warmer, wetter climate, according to a new study by researchers at the University of California, Riverside and the University of Florida, Gainesville. The study, which was published in the Proceedings of the National Academy of Sciences, presents a historical view of how climate change and the resulting habitat loss can affect Earth's biodiversity. Titled "Origin, Paleoecology and Extirpation of Bluebirds and Crossbills in the Bahamas Across the Last Glacial-Interglacial Transition," the authors are Janet Franklin, distinguished professor of biogeography in UCR's College of Natural and Agricultural Sciences, and David Steadman, curator of ornithology at the Florida Museum of Natural History at the University of Florida. 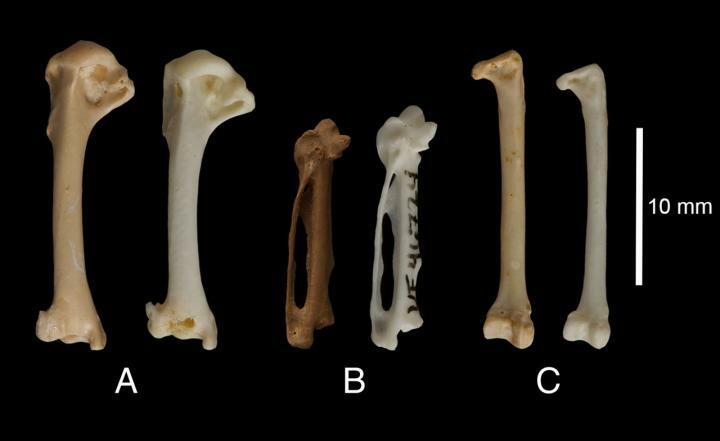 "The abundance of fossils, the presence of young birds among the fossils, and the evolution of a shorter wingspan in the Eastern Bluebird all suggest that these birds did not migrate to the island but were a resident population. But then they disappeared," Franklin said. Unlike many bird species that are now extinct on the Earth's small islands, the Eastern Bluebird and the Hispaniolan Crossbill disappeared long before the first people arrived, uncoupling their extinction from human actions, such as the introduction of new predators and habitat loss for agricultural use. Instead, the fossil record indicates they vanished during the Earth's glacial-interglacial transition, which occurred about 12,000 years ago and led to much warmer conditions and the start of the current Holocene period. "We know from studying these birds today that their habitats are pine grasslands that are found in cooler, dryer regions. These habitats were lost when the Bahamian Islands became more tropical," Franklin said. "In the coming decades both modern day climate change and other human activities will have a profound impact on our ecosystem. Anthropogenic climate change and resulting sea level rise are now happening much more rapidly than at the transition from the last ice age to the modern global climate. Species and ecosystems do not have time to adjust, especially when climate change is happening in a world where people have transformed the face of the planet in other ways, through deforestation and so forth."